To remotely manage your Chromebox, Chromebits and other Google hardware devices that run Chrome OS, you need to subscribe to a Chrome service or Chrome Management License. There are 4 types of services as listed by Google, and you choose the one that best suits your project. When you subscribe, you specify the number of subscription licenses that you need, based on how many Chrome devices you want to enroll. How you pay for licenses (subscription type) depends on what service you subscribe too. All the licenses allow you to lock the device into a 1 app kiosk mode. This gives you confidence that your devices are secure and not being hi-jacked to unwanted URL’s. Your Arreya digital signage channel will be the 1 app shown on your device. The Chrome Enterprise license allows you to configure policies and settings for Chrome devices, manage users, manage apps, configure networks, and more. Chrome Enterprise includes 24/7 Enterprise support from Google. The perpetual license is valid for the life of the device but can be transferred to a like device in the event of a device issue. This license is a great choice for digital signage as it allows you to “set it and forget it” and not worry about renewing the licenses yearly. The Chrome Enterprise annual license gives you all of the same features as the perpetual license, but is billed annually instead. Licenses purchased mid-term are able to be prorated to align renewals to the same date. The license allows you to configure policies and settings for Chrome devices, manage users, manage apps, configure networks, and more. The Chrome Education and Nonprofit licenses allows access to the same features as the Chrome Enterprise perpetual license at a lower cost for Education and Nonprofit organizations. The license allows you to configure policies and settings for Chrome devices, manage users, manage apps, configure networks, and more. The perpetual license is valid for the life of the device but can be transferred to a like device in the event of a device issue. The most important difference from the Chrome Enterprise Annual is this license is not intended for devices that will be used for workstations. It is perfect for digital signage but not recommended for Chromebooks. The Chrome Kiosk license is available as a yearly renewal.The Chrome Kiosk license is a low cost option great for digital signage and kiosk installations. The license allows remote management of the device, along with managing device policies, network configurations and app management. The Kiosk license doesn’t allows for user policy management and doesn’t allow public session mode on the device. For more information on each service type of Chrome Management License, refer to the description in the Arreya online store. Perpetual Management Licenses are available for Chrome Education, Chrome Enterprise, and Chrome Nonprofit. You can’t transfer a subscription from one device model to another in the same domain. We recommend reviewing the Auto Update policies for each device before you purchase a perpetual subscription. Annual Management Licenses are available for Chrome Enterprise and Chrome Kiosk. Bought per subscription term and can be renewed when the term ends. I got subscription licenses for Chrome Enterprise using the Admin console—Add your billing information to your subscription in the Admin console to automatically renew licenses at the end of each term. If you opt out of automatic renewal or don’t add your billing information, you’ll have to manually renew licenses when the term ends. I have subscription licenses with an authorized partner—When the term ends, you need to manually renew licenses by purchasing an additional subscription term from your authorized partner. Currently, there is no flexible plan available. If you purchase additional annual subscriptions mid-term, the cost is prorated and the new subscription expires at the same time as your original subscription. 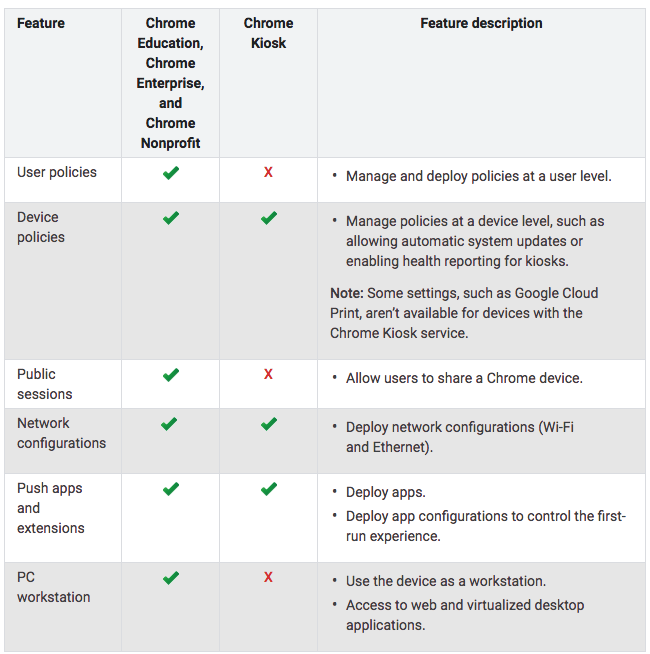 Chrome Enterprise, Chrome Education and Chrome Nonprofit services allow you to configure settings and enforce policies for specific Chrome devices. You can control user access, customize features, configure network access, and more. Choose the service that’s right for your organization type. Chrome Kiosk service gives you access to the settings you need to configure, deploy, and monitor a Chrome device as a single-app kiosk. It’s perfect for a device that’s used exclusively as a kiosk, such as a digital sign or point-of-sale system in a store. However, it can’t be used for public-session kiosks. This service is only available to business customers. For most Arreya digital signage subscribers, we recommend the Perpetual Chrome Enterprise Management License. A one time cost for the life of the device, there is no annual cost for updates or renewals. Google offers this license to non-profit 503c entities and certified educational entities at a large discount . This makes purchasing a large quantity of licenses very affordable. For projects that have a set cut off time, the Kiosk annual license may be the cost friendly alternative to the perpetual license. Contact us to discuss 319-294-6671, info@arreya.com or For more information go to Service and subscriptions.